Every couple of years, I head back to the Coop to pick up a new MIT t-shirt and a new hoodie as well. Never realized that I'm a little spoiled since it's right here in town. That is until I got an email from the folks over at the University of Alabama online store asking me to blog about them. My first reaction was "why of all the blogs out there would they want me to blog about them?" Then I realized, there's got to be a few of you reading that went to the University of Alabama before getting transplanted up here. So this post of is for you guys. If you're feeling nostalgic for the good 'ol days. Or if you're like one of my several pregnant female friends, here's a chance to pick up something for yourself or something for the incoming little one. And while typing this up, I just realized there's also those of you who are college football fans. I personally don't know anything about college football (I didn't know MIT had a football team until my senior year). And I'm too busy cheering for the Pats anywaz. College football starts soon right? 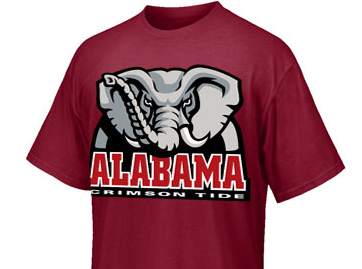 Time to get your University of Alabama shirts and gear. 0 Response to "Sponsored Post: University of Alabama Store"